This month, 1700+ teaching jobs will expire in the days to come. The organizations to hire teachers are Teacher Recruitment Board of Tamil Nadu, HAL, CTSA, RIE and Mizoram PSC. Teaching jobs is considered as one of the noblest job in the world. Teaching jobs have quite a stir in the job world and job aspirants make every attempt to secure teacher job. This month, 1700+ teaching jobs will expire in the days to come. Willing candidates need to check the list pasted below to get an idea about the teaching jobs that are available. Some eminent government organizations have issued notifications to recruit teachers. To apply for teaching jobs, candidates need to have post graduate degree along with B.Ed degree as well. The age limit needs to be checked before applying for any job. 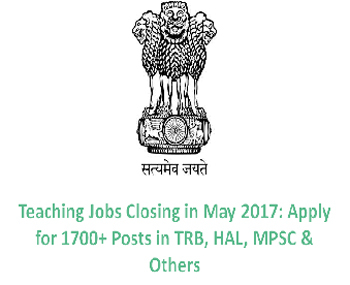 The organizations to hire teachers are Teacher Recruitment Board of Tamil Nadu, HAL, CTSA, RIE and Mizoram PSC. It is advisable for eligible and willing candidates to take a look at other information before applying like application process and selection procedure.